The Book Plank interviews Lawrence M. Schoen, author of Barsk. Collider chats The Martian producer Aditya Sood and Dr. Drew Feustal of NASA. Coode Street interviews Elizabeth Bear and Scott Lynch, of Shoggoths in Bloom. Happy Indulgence interviews Brett Michael Orr, author of The Bureau of Time. Infoshop News interviews Adrienne Maree Brown, of Octavia’s Brood. Medium interviews August Cole, editor of the War Stories From The Future. My Bookish Ways interviews Elizabeth Heiter, author of Seized. My Bookish Ways interviews Simon Sylvester, author of The Visitors. The Qwillery interviews Peter McLean, author of Drake. Reddit recently held an AMA for Daniel Jose Older, author of Midnight Taxi Tango. Science World Report interviews Brian Clegg, author of Ten Billion Tomorrows. These Are the Actor You’re Looking For interviews Ahmed Best, Jar Jar Binks. 7 things we learned about Star Wars: The Force Awakens from its music. 10 Reasons To Watch The Star Wars Prequels Before The Force Awakens. Aliens Is Really A War Movie, according to The Federalist. Aliens Occupy Los Angeles in Colony: USA Network’s science-fiction drama series Colony offers an Orwellian view of Los Angeles, where residents splinter into factions. Avatar Is a Much Better Movie Than You Remember. Right, and so are the prequels. Caleb Hutchins gets deep, positing that The Force Awakens is an allegory for the generational experience of millennials — and that spells big things for the next films. Could Reset, a new Asian time travel thriller, be next year’s breakout action movie? Dictatorship beats democracy—what China is learning from Star Wars. 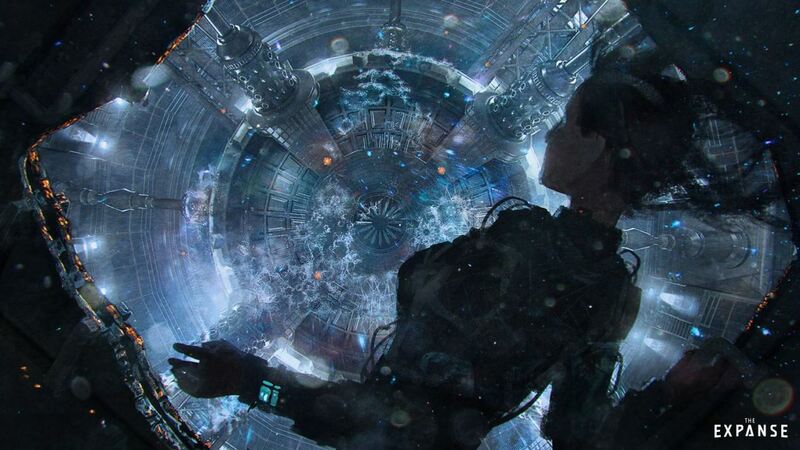 The Expanse is the best new science fiction series in years. The First Order Are The (Anti)-Heroes Of The Force Awakens says The Federalist. On the one side, we have state-sponsored terrorists. On the other, First Order. Five great sci-fi novels to make you forget Star Wars. How Colony Explores Life in an Occupied Los Angeles. How David Bowie Helped Shape Science Fiction as We Know It: From “Space Oddity” to “Lazarus,” Bowie gave voice to the anxiety of science fiction. How did Kurt Vonnegut feel about e-books? How Oliver Tarney designed the sound of The Martians‘ monster villain: Mars. Maybe Supreme Leader Snoke Isn’t A Hologram After All. The New Jersey Institute of Technology that looks at how Star Wars and other bedrocks of the sci-fi canon influenced and predicted the future of computer science. Newsweek looks at a genre giant in Star Trek: The 5-year Mission That Lasted 50. Philip Pullman says professional writers set to become "an endangered species." Popular Mechanics discusses 16 Sci-Fi Things To Look Forward To in 2016. “Space Voldemort vs Whiny Space Criminals” the highly entertaining reactions of a Star Wars virgin to her first viewing of the original trilogy. Star Wars Talking Points – and the stuff I didn’t get to say on NPR by Kevin Maher. Star Wars: the three biggest unanswered questions from The Force Awakens. Top Sci-Fi weapons in the Universe. Who is Boba Fett? What we can Learn from the Prequels – Noelle Stevenson (of Nimona and Lumberjanes awesome sauce) breaks down her own theory. Why Revenge Of The Sith Is The Worst Star Wars Movie. Nope. No Jar-Jar. Why The Shannara Chronicles Is More Like Star Wars Than Lord of the Rings. Wired says The Force Awakens Has Changed Star Wars Forever.